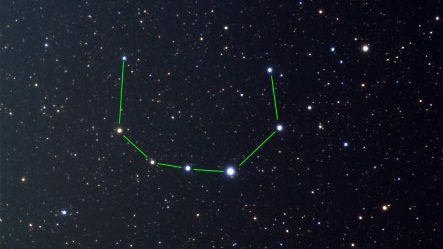 Fixed star Alphecca, Alpha Coronae Borealis, is a 2.2 magnitude star in the Northern Crown, Corona Borealis Constellation. It is a brilliant white binary star located at the base of the Crown. Alphecca is positioned at 12°18′ Scorpio with an orb of 2°10′. 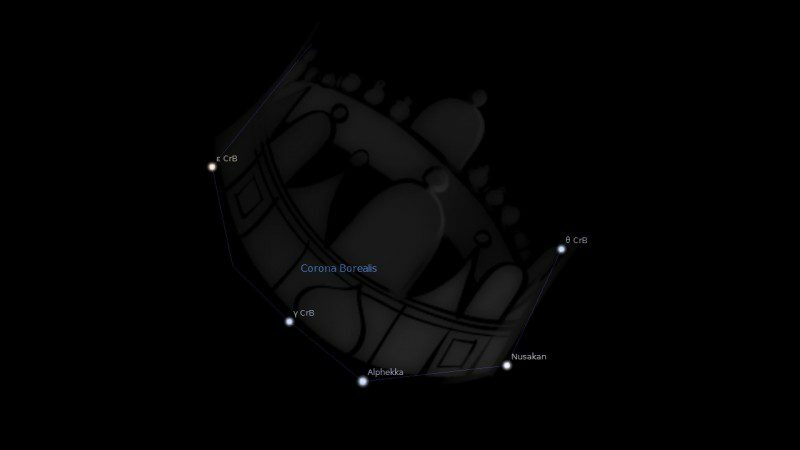 Other names for alpha Coronae Borealis include Gemma, Gnosia and Asteroth. Alphecca is Arabic for nayyir al-fakka “the bright star of the broken ring of stars”. Gemma is Latin for “jewel”, Gnosia (Gnōsia stella corōnæ) is Latin for “star of the crown of Knossos”. Asteroth is Hebrew for”Astarte (idols)”. Fixed star Alphecca is of the nature of Venus and Mercury. It gives honor, dignity and poetical and artistic ability. 1. Fixed Stars and Constellations in Astrology, Vivian E. Robson, 1923, p.131,232,242. 3. Fixed Stars and Their Interpretation, Elsbeth Ebertin, 1928, p.63. 4. The Fixed Star Health and Behavior Imbalance, Ted George and Barbara Parker, 1985, p.92. This is the star that has been walking the path of the underworld and has now emerged to be visible in the world of humans. This star, the Heliacal Rising Star, is the star that you were born under and it will bear gifts to you from the land of your past, your family and your genetics. It is your gift, the jewel or the treasure, which your ancestors handed you at your birth. This star is a theme in your life; helps to build your philosophies, and can at times take on a vocational pulse. This star is the concept of a woman’s crown: possible achievements in a quiet, passive way. Yet this crown of flowers also contains thorns and, although there are advancements through life which are not necessarily through one’s own efforts, there is always a price to pay. Alphecca’s presence in your life can indicate an offer that will change your social status or community standing. This advancement is not one gained through hard work but rather through love or luck. This gift or possible advancement should be considered very carefully, as the star implies that you may have to go through a dark or heavy period as a result. I guess this means that our arrogance is not as harmful as it would be otherwise, because in a way we are protected… But then again, in my case with Venus and North Node only 0°14′ away from each other (13°55′ North Node 14°09′ Venus), this much basal, mundane desire in a star with a propensity for sexual adventurousness indicates that I might harm myself from trying to much to get validation through other people’s confirmation of my beliefs, self-conception and that I am loved by them. My own Midheaven is at 13°04′ Scorpio and being charged by a close activation of my Uranus-Mars midpoint activation. They biquintile each other and quintile my Midheaven, North Node and Venus. So I’m excessively rebellious and will defend being a sexual maverick to the bitter end. Well, I am widely famous and hated in my country because of my nonbinary gender identity (truly enormous: I overshare), and also lose my temper with other LGBT people in our internal debates about what it means to be transgender (if just an internal identity or an active process to come as a different thing through medical interventions – I defend the earlier case, and that everyone should be respected according to what they believe to be their own narrative), and I also defend that asexual and aromantic people have struggles close enough to our own so they should be allowed to claim their space on the tables of united sexual and gender minorities. I have Midheaven opposite Sedna so this arose from a theme of alienation from the very patriarchal paternal side of my family (Sedna talks about betrayal by men and by the father: now consider it conjunct IC, South Node and Admetos, and opposite Venus in a very feminine star!). Now I don’t want anyone else to be denied for pursuing their inner truth and being honest with themselves, regardless of what other people believe to be ugly, excessive or incomprehensible. And it is not incomprehensible to me, not only because of enough orb for Accrux, but also because of my Saturn at 7°07′ Pisces, close to Sadachbia and Deneb Adige, and my Sun at 28°21′ Sagittarius, close to Etamin. I should moderate my North Node, myself, for it is long known to Jyotish Astrologers as Rahu, the malefic head of the dragon, responsible for all forms of arrogant, intense desire karma. Even though it is, together with Venus, my Yogakaraka and the planet closest to my Midheaven, so the hardest one not to express. Well, I /do/ have a resentment at the Universe related to my past life lore (Sedna in the 4th house often means that this is our first incarnation in this dimension)… But as soon as war was declared and I could understand what was going on, I still preferred to bit my lip and choose the good side. Nevermind, this is not mentioned because it was culminating but due to another reason. I don’t really get that report. Asteroth is cited as a name for this star, which is the mocking name Hebrews gave for the goddess Ishtar. I saw the star of Ishtar (at the time, I didn’t know what it was) in approximately March or April 2018 when a friend guided me through astral projection to help me identify spiritual contamination in my home, and ever since, I’ve been more aware of my mediunity. I also saw my spirit guide who is half-man, half-wolf in his wolf form. As I said further above, I have Midheaven 13°04′ North Node 13°55′, Venus 14°09′ and also asteroid Cybele (which is definitely connected to nonbinary people) at 14°22′ (I also have Saturn on Deneb Adige and Sadachbia by 7°07′ Pisces). My spirit guide/s, conversely, is/are allegedly connected to my natal Sedna in 12°45′ Taurus, close to my IC and my South Node. After this happened I saw a goddess who looked a lot like Aphrodite in terms of body, clothing colors and hair color but had the golden crown and the breast supports of Freyja in my dreams twice. An important aspect of my mediunity is that I can smell helpful spirits as random, unexplainable smells of fruit, and more rarely flowers, perfume or herbs (also, I can feel them as a not-unpleasant-pain grabbing the onstep of my left foot, as electricity running through my body – Martial spirits – or as if I had clouds inside my ear drums more recently, and this is more common, but I’d say this part is more ruled by Deneb Adige, while Alphecca is the good fruity, flowery or herbal smells). I also have prophetic dreams, like someone who is going to die soon, a house appliance about to malfunction, or a tragedy (for example, the burning of Brazil’s National Museum last year); good or revealing things are less immediate and harder to relate to the dreams, but they also take place (it is rare for me to have bad dreams, usually they are just very odd and eccentric, I have Uranus and Neptune in the 12th house of sleep and dreams). Often also see intrusive thoughts of people or beings I don’t know right before or after sleeping. As I research deeper about it, I always find something relevant on the internet. I have about asked this to other people who have Saturn over Deneb Adige and Venus over Acrux and Alphecca (we were common in 1994) and they report similar experiences, and also prophetic or archetypal dreams, and those visions before and after sleep.